In addition to providing ready-made magical products like our Mercury Retrograde candles and Prosperity mini-mojo bottles, we are also available to advise you as to the ingredients and techniques you might try for the spell or crafting of your choosing. We aren’t ones to preach, but we’re happy to teach. Just ask! If you’re not the do-it-yourself type, or if you find yourself in need of a helping hand or expert push, one of our experienced, ethical magical practitioners can craft a custom spell for you. We charge and dress candles or craft charm bags tailored to your needs. We hand pour our own candles in over fifty colors and color-combinations to make sure we have the perfect hue for every job. We may suggest an herbal bath, anointing oil, or other components to enhance the work. 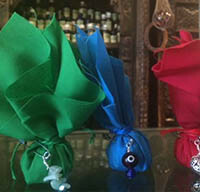 We sell ready-to-go spell candles and charm bags in our online store. Fully custom candles and charm bags are priced to include a consultation and reading, which your practitioner will perform before creating your item. A perk of visiting the shop in person is that simple intuitive consultations done for custom items are free at the counter! Tarot, Mediumship, Palmistry, Numerology, Tea leaf & Coffee grounds reading, I ching, Bone throwing, Dice reading, Pendulums, Automatic writing, Channeling, Psychometry. Reiki, Polarity, Emotional Freedom Technique, Chakra Balancing, Crystal Healing. Rootwork, Un-crossing, Soul Retrieval, Ancestral Healing, Spiritual Cleansing, Shamanic Journey, Exorcism, Counseling. As much as we love a good book and admire the power of the internet to bring people and ideas from around the world together, nothing beats gathering around the fire, face to face and heart to heart with your community. 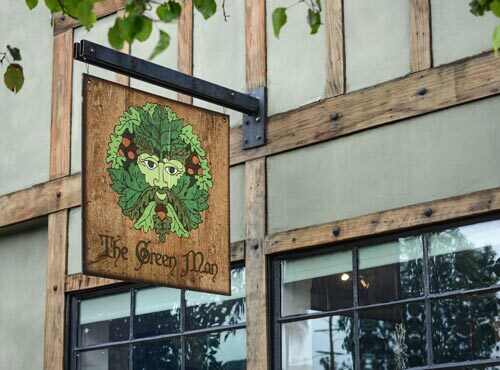 The Green Man is dedicated to providing space for seekers and practitioners of the Old Ways and Elder Faiths to share their diverse gifts, knowledge, and experiences with each other. Our staff of magical practitioners, our line-up of professional psychic readers & spiritual healers, as well as esteemed persons and groups from our local community, plus the occassional out-of-town guest, fill our calendar to the brim! We have events and classes every day of the week, except Mondays when we are closed to prepare for the next week’s shenanigans! Class topics include +Clairvoyance +Crystals +Energy Healing +Herbalism +Hoodoo +Intuition +Magic +Meditation +Mythology +Paganism +Reiki +Scrying +Shamanism +Southern Conjure +Spellcrafting +Spiritualism +Tarot +Wicca +Traditional Witchcraft +and more. Events include ceremonies for every Esbat (moon) and Sabbat (season) as well as +Drum Circles +Psychic Faires +Reiki Circles +Spellcraftings +Seances +Vision Quests +Movie Nights +Tea Parties +and more. At Beltane (May Day) and Samhain (Halloween) we present our public rituals off-site to accommodate our 200+ guests! 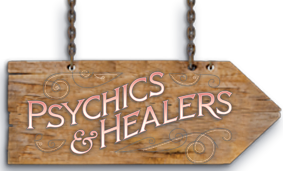 Our psychics, intuitives, and mediums, as well as some of our metaphysical and traditional healers, are available for parties, events, faires, and receptions. Readings can be life-changing, mind-opening, and immensely entertaining! It’s a treat your guests will not soon forget. Our manager will help you determine how many readers you need and what length of readings to offer to accommodate your guest list. We are trained, ethical, professional practitioners of the Old Arts, but we like to have fun too and are happy to wear a little extra eyeliner and bust out our crystal balls if you’re looking for that old-time flavor. For most events it is $100 per hour with a $200 minimum, plus a $50-100 outcall fee depending on your location and requirements. This price is per reader. Services must be paid for in advance by credit card for identification purposes. Further identification may be required. 48 hours notice required for full reimbursement of cancellations. Give us a call at (818) 985-2010 for more information. In addition to our in-house spellcrafting and spiritwork, we also have practitioners available for magical outcall services such as space or house cleansings and blessings, warding (protection), and entity removal (Ghostbusters! Seriously though, we handle spirits with dignity and respect… who ya gonna call?). For simple house or space clearings, blessings, and wardings, basic supplies are included in the price of service. Prices may vary depending on the size and condition of the space being addressed, but generally it will be $200 for a 2 hour clearing, plus a $50-100 outcall fee depending on your location. For targeted services such as warding against a particular issue or for addressing entities or hauntings, a reading or on-site assessment may be required. Regular rates for readings apply. Once a professional diagnosis has been attained then the outcall can be booked. As with booking for events, magical outcalls must be paid for in advance by credit card for identification purposes. Further identification may be required. 48 hours notice required for full reimbursement of cancellations. If you are looking to host a house blessing ceremony or ritual for you and your guests to participate in, then you’ll be looking for a priest, priestess, or clergy person who is trained to lead others through the work. Read more about Clergy Services below. To book an outcall or learn more about our outcall and clergy services, give us a call at (818) 985-2010. In need of a sacred ceremony or rite of passage? We have ordained clergy available for handfastings, house blessings, weddings, funerals, sainings, coming-of-age, sagings, mother’s blessing, cronings and other rites. Psychic Readings and Metaphysical Healing sessions may include spiritual advisement or instruction. However, if you are looking specifically for religious counsel or advisement from a clergy person, priest, priestess, or elder of Alternative Spirituality Traditions (Old Ways, New Age and a few paths inbetween) then please check out Our Clergy available on our Psychics & Healers website. Prices will vary depending on the size and type of ceremony or event, the supplies required, and other factors. For questions or to see about booking a clergy person, give us a call at (818) 985-2010. +But why do you charge for sacred work like blessing babies and marrying people? Shouldn’t religious services be free? Check out our Frequently Asked Questions for the answer to this and other excellent queries.